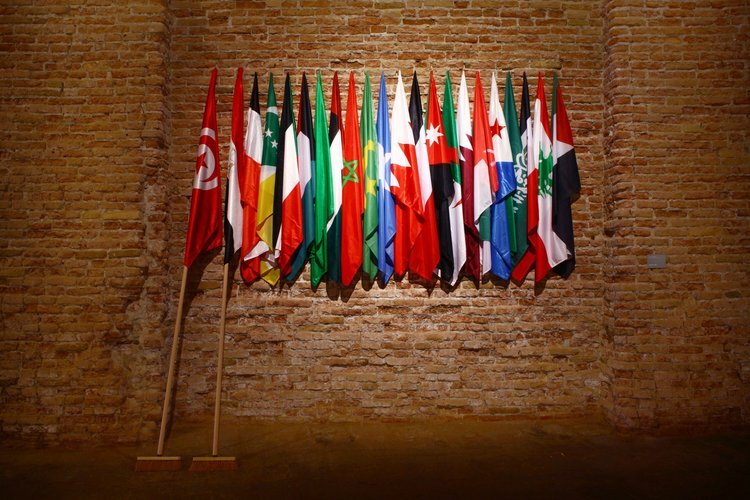 The 54th Venice Biennial was notable for a number of things, not least the number of Arab artists represented there and, in some instances, the cancellation of shows – for a variety of different reasons –associated with the Middle East and North Africa. In a time of on-going revolt in countries throughout the Middle East, it also came as no surprise that media interest in Arab-related shows was unprecedented. Most of our readers will be familiar with The Future of a Promise, a show curated by Ibraaz’s Associate Editor Lina Lazaar; however, in the following interview we invited three more curators involved in the Venice Biennial to discuss both the problems and the potential to be had in curating contemporary Arab visual culture in the current climate. The three other curators we invited were, respectively, Adelina von Fürstenberg, the President of ART for TheWorld, and Thierry Ollat, the director of the Musée d’art contemporain de la ville de Marseille (both being the co-curators of The Mediterranean Approach at the Palazzo Zenobio). Joining them, we also had Shady El Noshokaty, the executive of Ahmed Basiony’s Thirty Days of Running in the Place at the Egyptian Pavilion, and Lina Lazaar, curator of The Future of a Promise at the Magazzini de Sale. In a time of increased interest in the politics of artistic practices in the region, all three of these shows engaged in an increasingly nuanced approach to the question of art as a socially-engaged practice. In the interview here,Ibraaz set out to focus all four curators on a series of questions relating to the long-term challenges facing curators within and beyond the region and the various reactions to date to their respective shows. Anthony Downey: To start with, I’m going to direct a question to Shady, and then we’ll address it in part with each curator: What was it like to put on an exhibit in Venice, which showcases an Arab artist during a period when the Middle East and North African region was undergoing, and continues to undergo, such momentous change? Shady El Noshokaty: From the beginning we were worried because we knew that showing Ahmed Basiony’s work would be immediately linked to the Egyptian revolution and read through events there. We made a conscious decision to show both Ahmed’s artistic practice and his activist side. 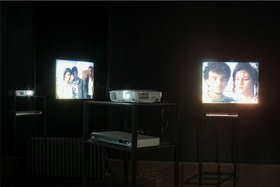 The show in the Egyptian pavilion had five screens, which randomly transmitted both a performance by Ahmed (in the garden of the Cairo Opera Housein 2010) and footage taken by him and others from Tahrir Square from the 25 until the 28 January 2011. As your readers probably already know, Ahmed was shot by a sniper on the night of the 28 and subsequently died. So, in showing both that footage and a performance piece we actively engaged with the relationship between art, the social realm, and politics. In retrospect, we could have explained our intentions further but we were quite surprised by the fact that the media mainly focussed on the Tahrir Square footage. The media coverage that was focused on our revolution at the time was, of course, also taking material from Ahmed’s work and his activity as an artist. The human and tragic element that formed the background to the show and his death also drew a lot of attention. At the beginning, when we were thinking about what form the show would take, I must admit I was not sure if we should put footage in the show from the first two days of the revolution, from the 25 to the 27 January. When we did, people started to accuse us of interfering with Ahmed’s project and artistic ideas. We had criticism from journalists who resented the idea of using actual footage from Tahrir Square alongside footage of the performance. AD: In a general sense, the criticism was directed towards the fact that it tended to heroicize or romanticize the artist, which, in turn, created an emotive response to the work and, as a result, confused the relationship of the art in question and Ahmed Basiony’s role as an activist during the revolution. SEN: It was really encouraging to see that the general response was very positive. People seemed very engaged with the work and ready to participate in the issues around it. We were careful to include as much contextual material as possible which I think helped people to engage with what they were looking at and provide a framework for understanding the various aspects of Ahmed’s work and life in general and specific terms. It’s also important to note that a significant amount of the criticism we received mainly came from people who hadn’t actually seen the show in Venice and the specifics of its installation. They just saw it on YouTubeand took their cue from that – I think that was unfair and very partial in this instance. We were very careful about not putting forward Ahmed as just a protester. The show was about art, but it was also about new media and the processes involved in making art. Lina Lazaar: The Future of a Promise was the biennale’s first pan-Arab show which, of course, took place in Venice at a critical time for the region; however, I should point out that the show was in process before the so-called Arab spring. Needless to say, quite a number of the works in the show related to current political and social contexts but we thought it important not to let the show be overwhelmed by current events. It just seemed too easy a route to take. When I look at the show now it is possible to see how a significant aspect of it was overtly commenting upon recent events. We could talk about Mounir Fatmi’s The Lost Springs (2011), which displays 22 unfurled flags with two of them – Tunisia and Egypt – supported not by flagpoles, as we might expect, but by brooms which signified the sweeping out of the old, with the use of an actual broom, and the possibility of more brooms being added to the piece over time. 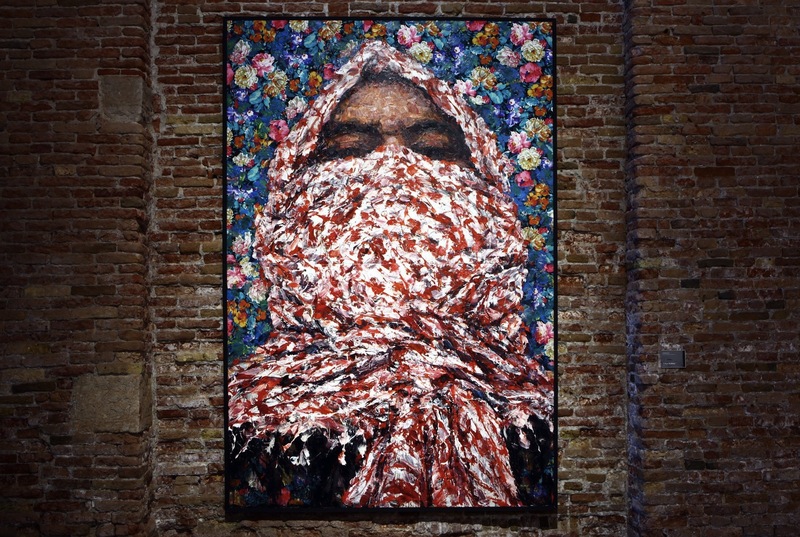 Ayman Baalbaki’s painting of a keffiyeh-clad youth also recalls symbols of resistance. But we wanted the show to be about art and how it relates not just to politics but the history of art and global aesthetic practices. As for responses to the show, we were inundated from the opening onwards with largely positive comments. There was a lot of media interest, so much so that we felt we were being held up as an example of sorts. Some journalists wanted to engage with the work in the show – and the media response was overwhelmingly supportive – but some were just looking for the ‘political’ angle above all other considerations. Adelina von Fürstenberg: I think that contemporary art, more than ever, cannot be disconnected from contemporary life. It is true that in the past avant-garde art of the 60s and the 70s was already engaged with the social and political spheres; today they continue to be closely conjoined. I muss admit, that it’s quite peculiar for me to produce, one more time, a show for the Biennale of Venice considering the current climate in the world and most specifically in Middle East and North Africa. Biennales are still based on rather outmoded notions of national representation. They are also, of course, a social game and certain formats and frameworks must be adhered to. 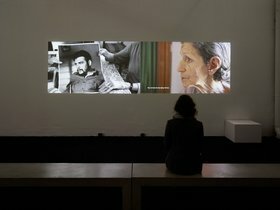 However, many curators believe strongly that Biennales are one of the best platforms to transmit ideas and artworks that can help people understand better the world, especially in the non-Western countries where art is an expression not so much of protest but of a genuine hope for change. This is why I asked Thierry Ollat to work on The Mediterranean Approach with me – he was already familiar with the complexity of these ideas and the challenges involved in addressing them. Zineb Sedira, Gardiennes d’Images, 2010, installation detail, The Mediterranean Approach, 2011, 3-screen video projection with sound. AvF: Thierry and I worked together in the 1990s when I was Director of the National Centre of Contemporary Art of Grenoble and its Ecole du Magasin (School of Curators) and he was Associate Curator. We also worked together in Venice. I am an Armenian, born in Istanbul. Thierry is now based in Marseilles, living in this mixed community, so we both know what it means to be Mediterranean, the positive, the negative, the conflicts and, of course, the dialogues. The show we did in 1993 during the Venice Biennale was more about how the West approaches the Mediterranean region along the lines of concepts such as the voyage and modes of productive exchange between cultures. Last year, before the ‘Arab Spring’ had begun, we decided to continue with this project. In Marseilles, I met with Zineb Sedira; it was an important encounter, because her way of reformulating the past is essential to understand our current present. She gave me the inspiration to create this show, as a reflection about the role of art in today’s Mediterranean region, more then about beauty or an aesthetic of art for art’s sake. In works such as Hüseyn Karabey’s No darkness will make us forget, 2011, for example, animation was used to depict the funeral of the Armenian journalist Hrant Dink who was killed in Istanbul in 2007 by a 17 year-old ultranationalist. At Dink’s funeral, 200,000 mourners marched in protest against the assassination. The short film, which was produced by Art for The World, portrays – with drawings by Aksel Zeydan Göz – the funeral and the protesters who peacefully marching through Istanbul. The audio broadcasts you hear in the film is the speech Mrs Rakel Dink addressed to her husband and to the crowd on that day – a message that was effectively a manifesto of peace and tolerance. Thierry Ollat: I would concur with Adelina’s reading of this show and the various contexts of how it came into being. Working in Marseilles as I do, I have discovered how the mix of the cultures is important consideration when it comes to not only considering how culture works and operates but what it means to be contemporary. Marseilles is a very mixed city. People have come there from all over the Mediterranean area and further. It is interesting to re-consider how the mix of cultures could now orientate and direct our reflections on the historical emergence of globalization, for example. And I think the Mediterranean area has something to teach everyone in this respect. During the preparation of the show, together with Adelina, we thought about what we share throughout the Mediterranean region but also, perhaps just as importantly, what we don’t share. We noticed this lightness that people have throughout the region. Even in the worst conditions, even in the poorest situations, there is always something that is related to joy, to life, an enthusiasm and a sense of caring for family and friends. This is quite inspirational and really important, and this is something we can share on a wider scale. In a way, the show we prepared with Adelina was a bit un-politically correct. We thought that we could talk about important and dramatic topics but taking into consideration that the quality of the people, and of the artists working in this area, is situated in a ‘lightness’ of tone, so to speak. This is the reason why we decided to work with artists such as Khalil Rabah and Faouzi Bensaïdi, to name but two. If you look at Faouzi Bensaïdi’s film Le Mur (2000) you can note the humour in the various vignettes on offer. 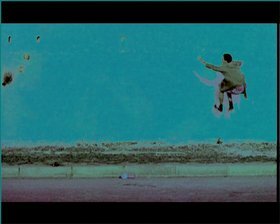 The whole film was shot in one frame with a steady camera in front of a wall in a Moroccan town. The wall effectively becomes a proscenium for all life, be it bizarre, joyful or indeed threatening. There is also an element of transgression where the individual and social clashes against one another. AD: I’m thinking also of Adrian Paci’s work. Was it included in the context of this familial network that you are considering here? TO: Yes Paci’s film Last Gestures (2009) is a very closely observed and intimate portrait of the relationships between family members at a moment that is highly symbolic for all of them and full of additional meanings: the context, that is, of a wedding party and the sense of drama and familial narratives that lead up to that moment when a bride leaves her family for another. TO: There is a sense that migration helps artists to understand the difference between two contexts, that which can be brought from their past experience and what that means in a new context. For Marseilles, which is the European Capital of Culture 2013, we are working a lot on this topic of transmigration. The experience of artists like Adrian Paci tells us about the global experience of so many people around the world. The questions of memory and discovery, of integration, of maintaining a culture that is undergoing mutation and migration –these are are key global topics. AD: Lina could you address two issues here: one, how did you approach the curatorial remit for The Future of a Promise, and also perhaps with an echo of Adelina’s notion of artistic ‘hope for change’ explain further the ideas behind it. LL: Again, it might be best to focus on one of the works in the show here to answer these questions, a work that became one of the central motifs in the show, namely, Lara Baladi’s Diary of the Future (2010). She began this project in 2007 when, for six months –following the return of her ailing father to Cairo after 50 years of absence – she watched and photographed the cups of Turkish coffee offered to well-wishers who had dropped by to ask after her father’s health. The work is effectively an archive of a network of social relations but it also alludes to the people who knew and cared for her father. Following her father’s death, this work became both a memorial but also a record of a time that was looking to an uncertain future, or, to paraphrase the artist, the extent to which our ‘past, present and future are entwined’. I would suggest that a promise is held out in this work, the promise of a future outcome, even of social and perhaps political change but this is just one aspect of the work. In more specific terms, Diary of the Future suggests, to me at least, that the aesthetic can potentially help us to engage with the realities of the past and present, if not the exigencies of the future. It was this sense of a coming or future event that The Future of a Promise sets out to explore and engage with through the works included in this show. AD: I want to return to Shady here and address the way in which globalization has given rise to new media and social networks. I was wondering if you could speak a little bit about this in the context of Ahmed Basiony’s show? SEN: When he shot this footage, Ahmed Basiony was among hundreds of thousands of others who were filming at the same time. 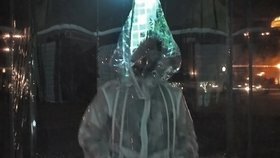 All the footage used here was by Basiony but many others recorded the same thing. The footage was quickly uploaded to the Internet, before we even showed the work. In a situation such as that witnessed in Tahrir Square over those fateful days, images were transmitted all over the world – including those made by Ahmed – and everyone could ‘join in’ so to speak. Globalization has of course brought about new ways of engaging with events but what became clear to us was the way in which the political self – the artists as protestor – became a key component in what his practice was about. Art always has a social and political component. SEN: That’s true! Because now art has become part of the moment in which it is produced – which was perhaps always the case. This is reflected in the project we presented. Our project was also about time. It presented two different events, both of which could be considered performative, with a year between them. So it’s also about time and the isolated figure – the individual separated from the social order which, in the first performance, can be seen in the way Ahmad isolated himself from the whole community, even from his family. For the second performance he was physically and emotionally involved in the global energy – in the energy that burst out in Tahrir Square and then moved to other countries in the region: Libya, Yemen, Syria. Somehow this image became a global image and was taken up by people the world over. SEN: Yes, I think that is a key way in which to understand this work. We could also talk about performance art, notions of repletion and endurance, transgression and transmission. The show was designed from the outset as a five-screen installation, but it’s important to know that they are not working synchronically. They work at different times and this is raw footage: we did not do any editing. The way these five screens interact with the viewer in the space is completely random. I’m an artist; I’m not used to being a curator. It’s part of my roots not to be involved in producing the work. So I choose to create these five screens and let them go randomly. AvF: I would like consider my self as a human rights oriented person, and have been so all my life. I do not go out in the streets to protest, but I help myself to communicate these issues with the language that I know most about, which is contemporary art. I’ve learned throughout the years that artists are the best activists, because they transmit their concern about human rights through a poetical approach which often makes it more accessible and less dogmatic. This is something that the public understands and appreciates. But this specific attitude towards human rights isn’t always understood by the system of art. That’s why I funded Art for TheWorld in 1996. It’s an NGO focused on the communication of those matters through contemporary art and culture. The Mediterranean Approach is definitely a human rights oriented exhibition seen through the lens of how art reinterprets and in some cases reconfigures our concern with the world and its contexts. It offers, indeed, enriching levels of engagement on behalf of the viewer and different ways of perceiving. El Noshokaty, Shady, Adelina Von Fürstenberg, Thierry Ollat, and Lina Lazaar. 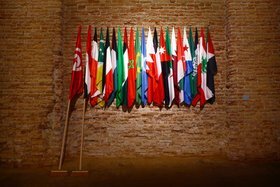 “Curatorial Conundrums – Arab Representation at the 54th Venice Biennale.” Interview by Anthony Downey. Ibraaz. Ibraaz, 14 Aug. 2011.